Lipman Law Firm handles workers compensation cases throughout the state of Iowa. Our workers compensation lawyer in Des Moines,, Jeff Lipman represents cases in all 99 counties and will travel throughout the state to accommodate the needs of the firm’s clients. Many claimants reside in other states who have been injured in Iowa, as well as claimants who’s employer is located in Iowa but live elsewhere. A number of those injured claimants are over-the-road truckers who have Iowa claims. Lipman Law Firm's workers compensation lawyer in Des Moines,IA has each injured worker’s medical file reviewed by a physician who provides the firm and the injured worker a summary of their medical records even before the employer’s directed care physician provides a rating. This helps place the firm’s clients at an advantage by aggressively working up the claim rather than allowing the employer’s work comp insurance carrier dictate the processing of the claim. Once the injured worker is at maximum medical improvement, the firm prepares a high tech color settlement booklet that presents the work comp claim in a comprehensive and professional manner that conveys strength and confidence. While injured workers have an interest in reaching a fair and just settlement in a timely fashion, it is important that the firm have the experience and expertise to present the case at trial when the employer’s insurance carrier is unwilling to pay reasonable compensation. Jeff Lipman has tried cases as a workers compensation lawyer, big and small in the Iowa Workers Compensation Agency, Iowa District Court, Iowa Court of Appeals, and Iowa Supreme Court. 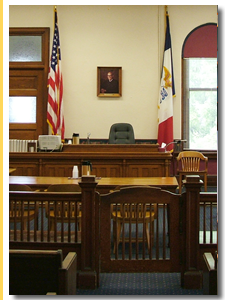 Contact a Iowa work comp lawyer representing clients in Des Moines, Iowa today to schedule your initial consultation. Jeff Lipman not only is a frequent attendee at work comp seminars, but also conducts training for work comp claim adjusters who work for some of the same carriers that insure employers here in Iowa. Jeff has a unique perspective from his experience in training employer’s insurance adjusters that allows him to understand both sides. Jeff takes his experience and expertise and puts it to work for injured workers. Jeff Lipman believes that being a lawyer is more than an 8:00 a.m. – 5:00 p.m.job. Clients have access to Jeff’s cell phone and encourages each client to contact him day or evening including weekends with concerns. Having access to your attorney should not be something that ends when you sign a retainer agreement. It is a quality that you as the client should demand from day one until the case is concluded. Fees for workers compensation claims are done on a contingency basis. That means the client is not responsible for attorney fees until and unless there is a recovery. For more information and a free consultation, please call Lipman Law Firm at 515-276-3411 or call Jeff Lipman on his cell phone at 515-778-5623.